Arrive in New Delhi and get picked up from the airport. If you arrive early enough in the day, we can take in a few of the sights of this historical city. We take the early morning flight from Delhi to Leh flying over the Himalayas. Get a window seat as the view is spectacular! Once in Leh, we’ll take it easy for the day, allowing our bodies to acclimatize to the high altitude. Walk around town and soak in some Ladakhi culture. You’ll be introduced to your Royal Enfield Bullet and we’ll take her for a short spin to get used to riding in India and learning how the Bullet moves. We depart Leh in the morning and follow the Indus River through canyons and plateaus before arriving at Lamayuru, a small hamlet surrounding the majestic Buddhist monastery of Lamayuru. You’re in luck as we’ll be witness to a monastic festival with the colors and sounds of Tibetan Buddhism. We take the backroad out of Lamayuru and ride high up where we can see the famous moon land. It’s a series of rocks that look very alien and as their names says, moon-like. The road is twisty and a bit sandy and great practice for the tough riding coming up. After a pleasant evening camping out in Temisgam, we ride away from the main highway along remote roads taking in small towns and the open land. Back on the main highway, we turn towards Leh. An exciting day as ride up to the world’s highest motorable pass, Khardung La at 17,663 ft. The initial smooth tarmac out of Leh gives way to boulders and stones as we ascend to extreme altitudes. 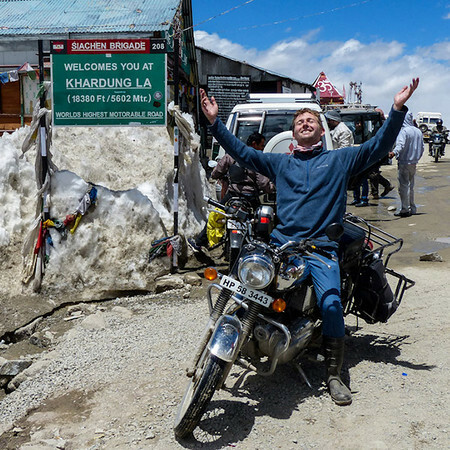 Enjoy being at the top of the world, then it’s another hair-raising ride back into Leh. We ride off from Leh for some fantastic riding over Chang La at 17,581 ft to the spectacular Pangong Tso, which in Tibetan means long, narrow and enchanted lake. It stretches into China and feels so far removed from the rest of the world. We’ll ride into camp and get the BBQ fired up and have a great evening under a star-filled sky. Enjoy the scenery once again as we make our way back over Chang La on the same route we took coming in but somehow it’ll look different this time. From Chimray, we turn south and head for the grand Taglang La, mistakenly labeled as the second highest motorable road in the world. It’s actually the third or maybe the fourth. It doesn’t matter as the scenery is mind-blowing! On the other side of the pass, we head towards the sublime saline lake of Tso Kar. Luxury camping under a starry night sky makes for a fitting end of the trip. We head back over Taglang La and follow the Indus River back into Leh. The ride comes to an end and we celebrate with a feast! Travel by plane in the morning back to Delhi and transfer to the hotel in Delhi. Get out and explore this culturally-rich city or gnaw on some delicious Indian street food. Catch your international flight out of New Delhi. The extra day at the end is because the Leh to Delhi flight has a high probability of being canceled on short notice due to weather and if you book your international flight on the same day, there’s a chance you could miss it. So, best to take it easy and use the time to either explore the city a bit more or catch up on emails!